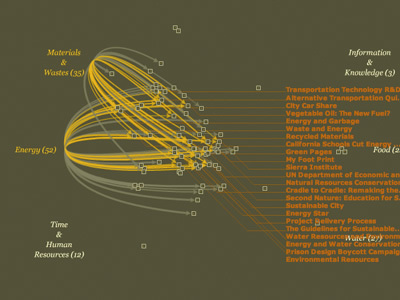 Presented as a poster at InfoVis 2004, IEEE's annual conference for data visualization, this is a custom information browser for viewing a growing body of research about natural resource systems. 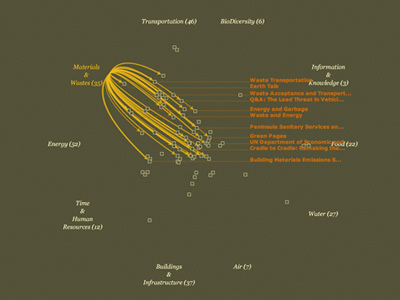 Each reference, contributed by students at Stanford University, is represented by a square and connected to one or more resource systems. Clicking a resource system text label reveals references to which it is connected. Line weight conveys strength of relationship. A heavy line indicates that a reference features a system. A medium weight line indicates that a reference includes a system. Finally, a thin line indicates that a reference merely mentions its connected resource system. References that feature a system are additionally treated with overlay text in orange. When lines have been turned on for multiple systems, references belonging to the intersection of sets are highlighted. Resource system labels can also be dragged, allowing for a malleable composition. And finally, hovering over any orange overlay text will reveal meta information (title, URL, author, publication date, submitter, submitter comments) about the active reference. Clicking will open the reference in a new browser window. Through a novel visual language, this responsive software offers an elegant, explorative way to see intersection and union relationships within data sets. This language can be seen as an alternative to Venn diagrams, with enhancements.